And its is one powerful BB gun. The Bison 701 is a Dragunov SVD replica. It's fps is 470 with 20g pellets and has a 50m-70m range, the gun is 1/1 scale (1210mm long) and weighs about 3lb. It's perfect for garden wars and entry level skirmishing because it's very reliable. The hand guard , stock, magazine, upper and lower receiver are made from ABS plastic while the internals, screws, fire selector and barrel are made from metal. The bolt is a bit hard to pull back as its a very powerful gun .Inside the box you'll find a decent sling, a pack of cheap bb's ( don't use cheap bb's they'll jam the gun) a screwdriver and some screws for the stock, a good quality speed loader, an instruction manual, safety glasses and the rifle. Many people ask if you can put a scope on the answer is yes: on the side there are mounting brackets for a special SVD scope mount with 20mm weaver rails to mount any scope. The gun comes partially assembled so all you have to do is screw the stock on. The gun has a hop up unit which can be adjusted, a detailed receiver with a Kalashnikov styled fire selector and adjustable sights for 10-80 metres. the magazine holds 50 rounds. The Real Dragunov was designed by Yevgeny Dragunov and built by izhmash. Originally it was meant to be a squad support weapon as assault rifles had medium range and were capable of fully automatic fire but it proved itself to be a brilliant sniper rifle. It's used as a designated marksman rifle and sniper rifle. It's semi auto fire and long range make it a perfect sniper rifle. The Dragunov has seen many wars and conflicts and is still in service today. This airsoft version of the gun is very good as a designated marksman rifle and excellent as a sniper, it's very reliable and it's never jam's it's powerful enough to penetrate a can or a plastic bottle, the only downside is that the gun has no scope mounts on the gun itself but it's more realistic with the side mount overall a great gun I would recommend to anyone. ABS Magazine & Gun Body. 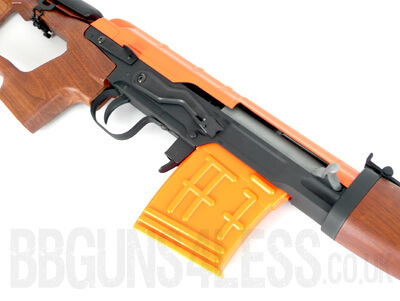 please note we only have the new version of this gun now that has more orange on it to comply with ukara rules. 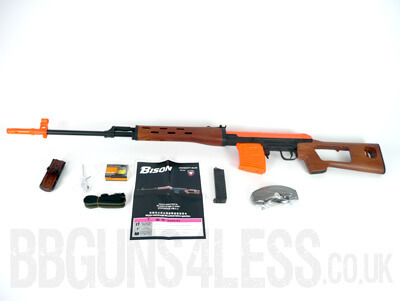 My review of my new BISON 701 Russian SVD Dragunov Bolt Action Airsoft Sniper Rifle from BBGuns4Less. Got this gun two years ago and is working just as well as it was when i got it, it packs one hell of a punch and is well worth the money. Good starter sniper. Thinking of buying this, but was wondering what size the rail is? Or could someone comment a link to a scope that fits? After reading all the reviews i thought this was a really good buy but i did however completely ignore The ProAirsofter and smilie's review which actually says how this isnt that good. It is really loud, all plastic, no scope, some plastic internals. 2. If you add the price of a good scope and scope rings to this then you could buy a g&g m4 which are amazing guns. I hope this helps put this gun into perspective. What BB weight to use. I have had this gun for 1 1/2 years and have recently started to use 0.25g BB's and i am achieving ranges between 70-80 meters which is outstanding, 0.12g BB's are only accurate from 10-20 meters (max) anything after that it will swerve off course due to the power of the gun, 0.20g BB's are good to use for ranges between 25-40 meters, I did use 0.23g BB's but the performance of these are probably just slightly better than the 0.20g pellets but not much of a notable difference, the 0.25g BB's however have increase the range by almost double with almost no power loss at all, this sniper rifle is basically the same as the high cost models with cheaper materials but to say they have used different materials the reliability and performance is amazing. I ordered this on Monday morning and received it Tuesday afternoon. Im new to airsoft, so haven't much to compare it to, but this gun is AMAZING!! Impressive size good weight and feel to it, the hop up is easy to set up and the iron sights are extremely accurate.The mag holds 29 rounds (trust me, I loaded it 1 by 1 just to check! )and has a nice 'klunk' to it when its installed. The cocking mechanism is easy to pull, and also has a nice sound to it. If your looking for a rifle on a budget, get this! Snipers are never quite as effective as they might seen. 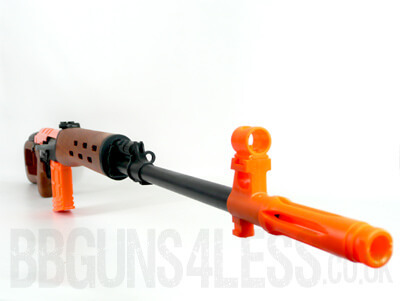 Is the spring hard to pull and is there a way to get a scope mount on it that works also would you use this as a sniper rifle. I have had this gun for 10 months now and it is still going strong with not even the slight bit of power loss even after pulling the spring back and firing it thousands of times, every part of this gun is solid. Please get this back because it's just what my team needs also it would really help if you got a scope mount and scope in stock. And tell us if you can't. who ever says this gun is amazing is easily pleased, its not bad but its not good its average for your money. if u want a good gun for less than that get the taurus 24/7, its more compact and it has more power. if your a beginer get it. but get the a&k one if u want value for your money. over all im not very impressed its just a lump of plastic so i hope that helped you to avoid one of those guns that look to good to be true.